Posted on Tue, Mar 20, 2012 : 5:48 a.m. The Ragbirds play The Ark this weekend. This could well be the year of The Ragbirds. 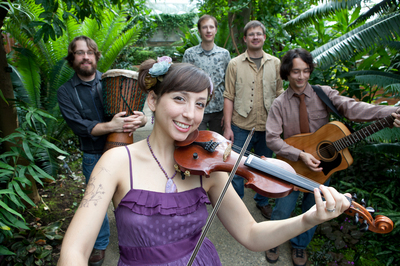 The Ann Arbor-based, Gypsy-influenced folk rockers recently released a new CD. They’ve been on the cover of iSpy magazine. High Times named them the Band of the Month for January, and they just did four performances at the prestigious South By Southwest music festival in Austin, Texas. Since they’ve put 12,000 miles on their vegetable oil-fueled tour bus just in the past two months, “Travelling Machine,” seems an apt title for their new disc. “We’ve been keeping our nose to the grind—it’s been a lot of good times and we’re really excited. It’s been real encouraging for sure,” front woman and multi-instrumentalist Erin Zindle said of the attention that’s now being paid to the band. Zindle and the rest of The Ragbirds, including brother T. J. Zindle (electric and acoustic guitar, vocals), husband Randall Moore (congas, tabla, djembe, timbales, bongos, percussion), Brian Crist (bass, percussion), and Loren Kranz (drum set, vocals), will perform at The Ark Friday night, fresh off the South by Southwest appearances. Who: Ann Arbor band making waves nationally. With Matt Jones & The Reconstruction. What: Folk rock embellished by Gypsy and other world influences. Where: The Ark, 316 S. Main St. When: 8 p.m. Friday, March 23. How much: $20. Info: www.theark.org or 734-761-1451. She said fans will notice a few changes in the band’s sound—nothing drastic, but evident nonetheless. The South by Southwest event has been something she and her bandmates have been hoping they could do for a while, Zindle added before the band headed south. Besides making music, The Ragbirds are known for a commitment to the environment, and even drive a tour bus fueled by vegetable oil obtained from restaurants along the way, a conversation starter on its own as they travel from gig to gig. The bus gets about the same mileage as it would burning diesel fuel, 15 or so m.p.g., towing a heavy trailer. “It’s not great mileage but it’s 90 percent fewer carbon emissions on vegetable oil than it is on diesel. It had a certain food-like odor but it smells so much better than diesel fuel,” Zindle said. Tue, Mar 20, 2012 : 10:56 p.m. I saw the Ragbirds perform last year with the Saline Players and then made it a point to attend their Sonic Lunch concert in Liberty Square. What a great show they put on. Erin Zindle has more energy than anybody I've ever seen on stage.